The CHEI Research Seminar brings together senior researchers, international education practitioners and aspiring researchers to discuss current research topics, develop research proposals and develop their methodological and analytical skills. 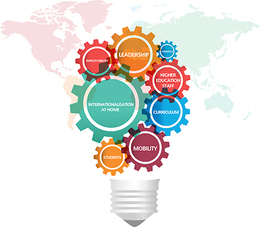 Through this bi-annual seminar, CHEI is developing a knowledge community in higher education internationalisation which is open to anyone undertaking research in the area or contemplating doctoral study. The seminar is a core component of the Centre’s Doctoral Programme. Many candidates use it to create space in their demanding lives to focus on the development of their dissertation proposal. Other attendees are formally enrolled in a doctoral program at another institution and use the seminar to network with other researchers. In the future, CHEI will be developing opportunities for candidates to undertake PhD double degree programs with institutions around the world. The seminar was developed with the support of the Researchers in International Education special interest group of the European Association of International Education (EAIE) to provide more formalised training on international education research.